It’s summer and I am not going to complain…..but…..
As I look out of the window and type these words, I can see a blue sky; the sun is shining; a gentle breeze moves through the trees and I know if I stepped outside I would be greeted by a pleasant temperature of about 20c. Not hot, but quite acceptable for the middle of August. Well I don’t want to complain or come across as if I am wishing my life away, because neither of these statements are true. However at this time of year I do start to look forward to the autumn and indeed to the winter. These seasons suit my photographic style so much better. The days are shorter, the sun is much lower in the sky, the trees have lost their leaves and the weather has the potential to be so much more atmospheric. 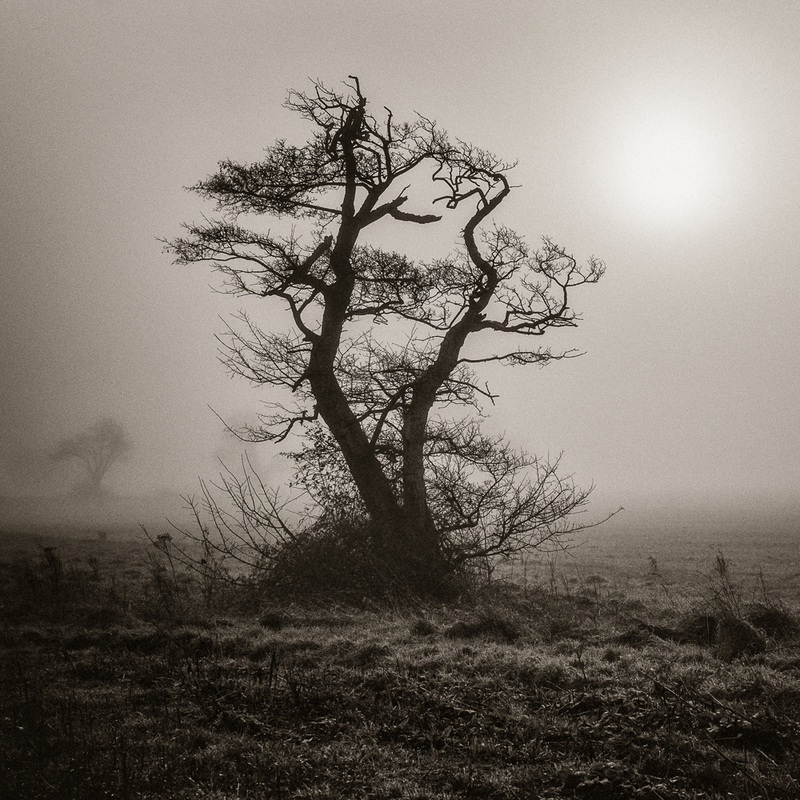 This photograph – ‘Tree in Winter’s mist’ – is typical of the conditions I like. The sun has yet to penetrate the early morning mist, and the tree is bereft of its summer clothing, revealing its winter skeletal form. Nor did I have to get up at 4am to find the sun this low in the sky. A distinct advantage as far as I am concerned! As I come to the end of this short entry, the sun is still shining outside and the garden looks as though there is work to be done. So out I venture with a trowel, shears and a garden fork. In a few weeks time I am more likely to be tempted to grab my bag, select a camera and a couple of lenses and see what the autumn season has in store. I can’t wait, but in the meantime I shall enjoy the rest of the summer and tidy the garden. ‘Lost Glove’ – photo titles or even some Haiku perhaps? Lovely capture, Alan. What a great mood! Thanks very much… you too. I don’t have your skill behind the lens, but I have to agree with you. Summer is too hot in Melbourne and I don’t like the bright sunlight and clear blue skies. (and too hot for me with a heart condition to be outdoors for most of it). I prefer the softer light of Autumn and Spring. (Winter can go either way). I prefer a bit of cloud cover too, especially for B & W.
Love the atmosphere in the the stark shape of the tree with the mist in the background in this post. Enjoy your gardening until the photography conditions change. I subscribe to the belief that bad weather makes better pictures. I really like this one.